MSPV offer Armoured Ambulance Vehicles that can be counted on to provide security while transporting injured parties in adverse conditions. If you are charged with transporting ambulatory patients under dangerous conditions, then you know full well that the safety of patients, drivers and medical personnel is paramount. MSPV designers will take your specifications into account and create a vehicle that is technologically-advanced and built to withstand whatever comes it way. MSPV Armored Ambulance is custom-designed to transport emergency medical teams in and out of dangerous areas, safely and securely. Based on the reliable, the ambulance is fully equipped with medical essentials for first aid and evacuation procedures in the field. It is easily manoeuvrable in off-road conditions, and its armoring provides maximum safety and protection to personnel. Equipped with a standard ambulance package, or can be customized by Strait to meet your specific medical requirements. MSPV Armoured Ambulance is fitted with a full field ambulance suite, which includes one stretchers and seating for two combat medics and two sitting patients. Comprehensive on-board emergency medical equipment includes full emergency first aid equipment and supplies, a ventilator/resuscitator, oxygen supply, IV tracks and secure storage for all medical items. 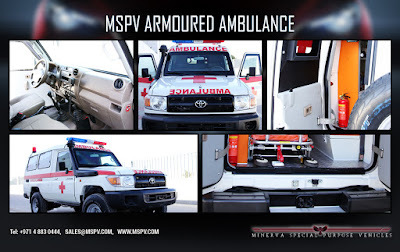 MSPV Armoured Ambulance is ideally suited for so-called hot extraction of patients in mine-threatened and other hostile environments where its high levels of passenger comfort and off-road capabilities are of particular importance; especially where on-road driving poses a high risk. In military configuration the ambulance is fitted with reversible or retractable markings, while for peacekeeping and other non-war operations, it can be fitted with the required markings, emergency lights and siren. 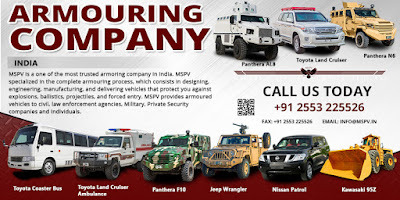 MSPV Land Cruiser Ambulance is fully armored and outfield with complete range of medical equipment providing ultimate security and versatility to emergency medical teams in the most hostile environments. The vehicle’s chassis, suspension and brake system are reinforced to enhance the capability to support the additional weigh of armoring. There are many places around the world where safety and security is an issue. In such instances, transporting injured parties can be a dangerous proposition. You can count on the safety and durability of our armored ambulance vehicles, and trust that they will perform their absolute best when they are needed most. It all begins with a personal consultation with our designers and culminates with today's finest and safest bullet-resistant vehicles. 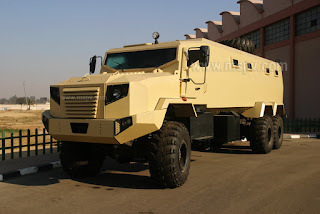 To learn more about the technical aspects of our armored ambulance for sale simply visit http://www.mspv.in. Otherwise to talk to one of our expert engineers about your vehicle requirements call +971 4 883 0444 today.